Cashmere yarns are the fiber of choice for those passionate about soft and luxurious knitwear. This diamond of the knitwear world can only be found in a few specific regions: Mongolia, the Tibetan Plateau, and Kyrgyzstan. It comes from the domesticated goats that live in these high and dry grassland areas. Beneath their thick, coarse outer-coats of hair that protects them from the blowing winds, negative temperatures, and winter snows lies a soft and downy undercoat of fur, which is what we call cashmere. This downy undercoat is a product of the goat’s evolutionary adaptation to the extreme winter conditions (the weather can drop to -58°F), making it one of the warmest and lightest fibers in the world. The longer the days and colder the weather, the longer and finer the goat’s hair will be, which is why these areas produce the finest and best cashmere in the world. In spring, the goats begin to molt and shed their coats in anticipation of warmer temperatures; this is when the native herders begin the cashmere harvest. They shear off the coarse outer layer of hair and begin the painstaking process of gently combing out the precious undercoat of warm, soft hairs. The herders must time this combing carefully because if done too early, the cashmere is not ready to be shed, and if too late, it will fall from the goats and be blown away by the wind while at pasture. The herders comb, wash, and hand sort the wool to remove any coarse outer-coat hairs. They then sort the fibers by length and size. The longest and thinnest hairs will be sold for a premium price. The thicker and shorter hairs will be made into less expensive garments and are often used as part of a blend with other fibers. As you can see, the supply of cashmere is rather small—it accounts for only 0.2% of the total output of all animal fibers: it is restricted by geography, dependent upon mother nature, and the will and skill of the native grassland herders. It takes the hair from 3-4 goats just to make one sweater! This rarity mixed with a lengthy manual fiber-to-yarn process is what contributes to cashmere’s reputation of being truly a luxury item. 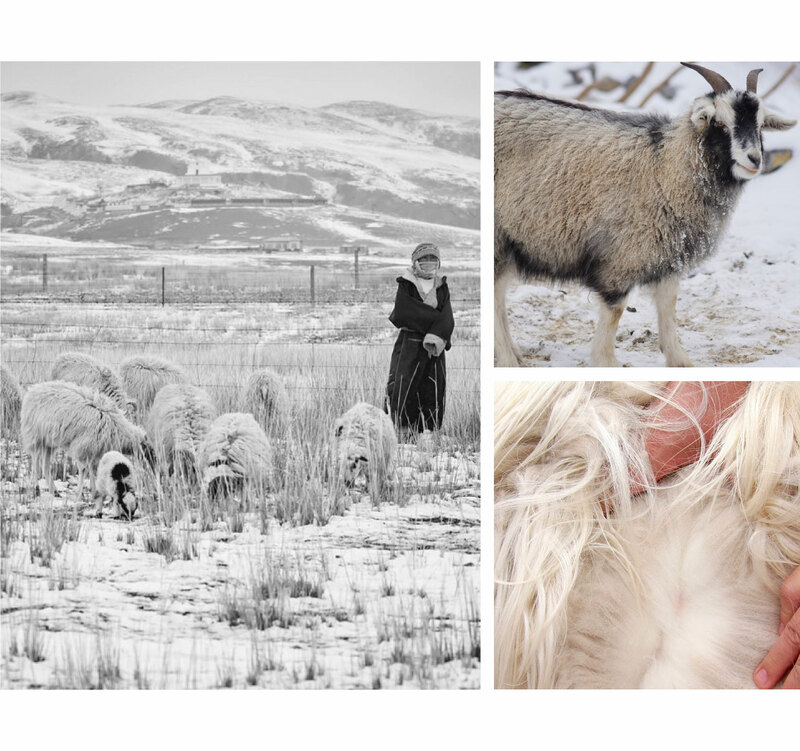 The fineness of a cashmere item comes down to the length (measured in mm), diameter (measured in μm—microns), and color of the hair collected from the goats (cashmere comes in three colors: brown, grey, or white; with white hair being the most valuable as it is the easiest to dye). 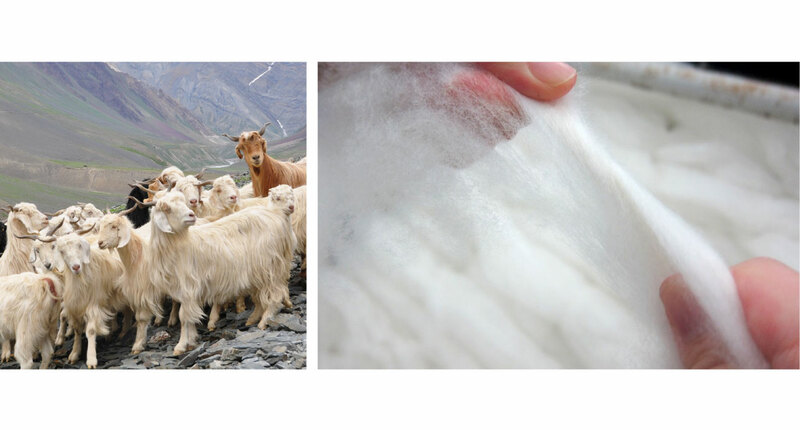 In order for the goat hair to be considered cashmere, it must be under 19 μm in diameter (human hair is on average 45 μm) and be at least 34 mm long. A micron is one millionth of a meter! The diameter of the hair is what indicates the softness—the thinner the diameter, the softer the fiber will be since it is less likely to push against the skin in a way that you will feel a prickle. Only the most uniform and longest fibers (longer than 36 mm) pass through an additional combing process to be converted into “worsted” yarn. Worsted cashmere creates a finer, smoother, and higher-quality yarn that produces a garment that is more lightweight and breathable. The feeling of softness is also created by the scales and structure of the hair shaft. Cashmere fibers don’t have a medulla, which is a stiff, structural piece running the length of the hair shaft, common in sheep with coarse fleece. The nonmedullated (hollow) hairs of cashmere make it extra smooth, which translates as making it extra soft—and provides air pockets that add to its lightweight warmth. The quality of the water where the raw cashmere is dyed and processed is also extraordinarily important to the final quality of the garment. During dyeing, the raw fiber is immersed into warm water for three hours, and the unique qualities of the water impart particular grades of softness onto the fibers. The alpine regions of Italy and the highlands of Scotland produce the finest cashmere in the world because of their unique freshwater lakes, such as Lake Como of Genoa, the alpine lakes of Biella, and Loch Leven in Kinross. Cashmere is then generally spun into either single or double-ply thread. The ply denotes how many yarns are twisted together to make a single thread—two-ply means that two yarns are twisted together. It’s thought that the higher the ply is, the more durable the thread will be, since it is composed of more strands. Cashmere is spun into plies anywhere from one to eight. A cashmere garment woven with two-ply is usually considered plenty durable and not likely to get holes, and depending on the quality and reputation of the manufacturer, single-ply cashmere can be plenty durable as well, yet with an added ethereal quality. Cashmere fibers can be compactly arranged during the spinning process, resulting in excellent warmth retention (typically 8 times that of wool) without adding bulk, which is why cashmere garments are uniquely breathable, warm, and comfortable. People who choose cashmere, do so because they know that it is one of the most beautiful fabrics that will last them a lifetime of use if cared for properly.